There’s more to Mindfulness and Surfing than the title suggests. With every turn of a page you discover something different. Religion, history, travel, environment, music and more. And these nuggets of knowledge are shared in poems, exercises, recollections, philosophies and short stories. To bind these varied strands together, there is of course a strong thread of mindfulness and surfing. As the sub heading suggests, the contents are most definitely ‘reflections for saltwater souls’. Before you even turn a page, you’ll be struck by the beauty of this book. Classic hardback, dark green, blue and black tones to evoke a stormy sea, gold lettering to make the title glisten and a simple but striking illustration by Melvyn Evans. The illustration is of a surfer drop-kneeing into a monster wave on a stormy day, perhaps an impression of Sam surfing at Gwenvor. The wonderful illustration is echoed throughout as headers and backgrounds. It’s the sort of book you want to leave lying around your home. For friends to be distracted by it’s beauty and discover the curiosity quenching content within. Sam Bleakley is an academic, longboard champion, writer, lecturer, adventurer, jazz lover and father (details below). As he says in his book “despite being stereotyped as brain-numbed hedonists, surfers can be thinkers”. If you’re a surfer who likes to think, then I think you’ll like Mindfulness and Surfing. So what’s the book about? As the title suggests ‘mindfulness and surfing’ feature throughout but as I said in the introduction there’s a great deal more. Mindfulness for surfers is a bit different according to Sam. Mindfulness usually involves stopping, reflecting, clearing the mind and regaining a sense of self. Surfers are active, alert, intent on balance and we immerse ourselves in our environment (literally). Or as Sam puts it, mindfulness for surfers is a process of going from egology to ecology and generating a ‘bodymindfulness’. 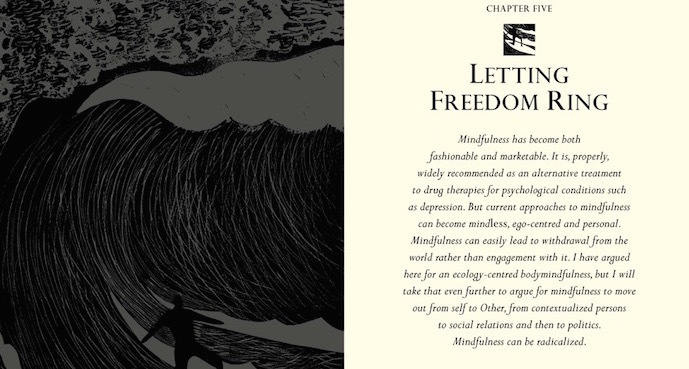 Throughout the book there are mindfulness exercises to help you achieve bodymindfulness, enhance your surfing and life. Religion is an important element of the book. Not in a preaching, chanting or indoctrinating kind of way but in an informative and gentle way. Taoism, Buddhism and Confucianism are all discussed, quoted and used to explain the power, spirituality and beauty of surfing. From Rod Sumpter longboarding the Severn bore to Hawaiian royalty riding Olo boards. Sam dispenses little history lessons to enlighten us on every element of our sport, from the craft we ride to the different waves that crash upon our shores. As a surfer, competitor and team member of surfEXPLORE, Sam has travelled to some extraordinary places to discover unexploited waves. Sam shares his cultural insights, optimism, and knowledge of sustainable tourism with local communities. To help them build a brighter future and inspire surfers from around the world to renew ‘The Search’ for uncrowded waves. This book contains fantastic tales from Liberia, Sierra Leonne, Haiti and Hainan Island, all interwoven with religion, jazz, ecology and culture. Surfers are literally in at the deep end when it comes to environmental issues. Every time we cross a beach or rocky shore to the surf, we will stumble across a carpet of plastic. Every time it rains we get swamped in sewage discharge from Combined Sewer Overflows. Sam is an environmental ambassador and campaigner. He shares experiences of polluted waves and coastlines in his book, and encourages positive activism at every opportunity. For all of Sam’s achievements, if a person can inspire their daughter to utter these words they have wisdom worth reading. Mindfulness and Surfing is available to buy on 5th May 2016 from all good booksellers and Amazon. Sam is an academic with a Degree and Masters in Geography from the University of Cambridge. He’s a Fellow of the Royal Geographical Society and is also researching a part-time PhD at Falmouth University on Haiti, surfing and travel writing. Sam is also the course coordinator and senior lecturer for the Cultural Tourism Management degree at Falmouth University. During his studies Sam found time to become a multiple UK and European longboard champion. Sam has won two European longboard titles, eleven national longboard titles and has competed on the World Surf League longboard tour. Oh and nearly forgot, he’s won National and International Paddle Race Titles as well. Sam’s surf and travel writing has appeared in over seventy different publications from The Financial Times to The Surfers Journal, and has been translated to over a dozen languages. He has contributed to several surfing books and published two of his own Surfing brilliant corners and Surfing tropical beats. 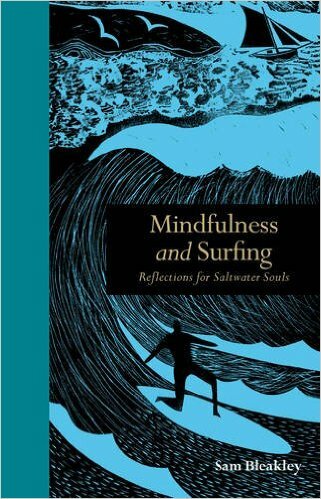 Mindfulness and Surfing – Reflections for saltwater souls is his latest and available for purchase on 5th May 2016. As part of an international surfEXPLORE team including legendary photographer John Callahan, Emi Cataldi, Erwan Simon and regular guest surfers, Sam pushes the boundaries of surf exploration. When researching new locations, they prioritise places with a strong cultural, historical or social context. Places whose appeal goes beyond the perfect wave. Jazz lover and father. Musical metaphors are abundant throughout Sam’s writing, as are glimpses into his family life. Sam resides in Gwenvor, Cornwall with his wife, Sandy and children Reuben, Lola and Cara. As you can see Sam likes to pack a lot into his life, and the same can be said about his writing. • Who is Mindfulness and Surfing aimed at? Who would you like to read this book? Anyone passionate about being on or near the ocean, and particularly those who enjoy riding waves, or would like to try to learn to surf. Surfing is a beautiful and powerful way to be ‘in the present’ (the best definition of ‘mindfulness’) and engage intimately with the coastal environment and coastal communities. For me, the pillars of happiness are mindfulness, resilience, positivity and empathy. Surfing provides all of this and more. Most people who commission something, or pitch a project, event, or activity, like to pinpoint an audience and a direction. I do the complete opposite because I never like to box up the potential of something to inspire and wider audience. Surfing sometimes touches non-surfers who might never ride waves, but are inspired by messages connected to surfing. Therefore I do things with a creative drive because I am deeply passionate about them and feel people can learn, share and be inspired. This was the ultimate reason behind the new book. Writing it was a wonderful creative process, and therefore I’ll be delighted if some people enjoy it. • Why did you write Mindfulness and Surfing? What do you hope to achieve with the book? As I mentioned above, surfing offers so many rich lessons, and ‘learning through surfing’ facilitates such a wonderful understanding of yourself (your limits, desires and passions and abilities), the environment (particularly coastal change and perhaps ocean and beach pollution, such as marine plastics) and culture (of celebrating difference and cultural exchange). For me, difference and ‘otherness’ are important issues to confront on the planet because positive cultural exchange is a way we can all become more tolerant of one another, and live more peacefully by celebrating our rainbow-spectrum of approaches. But caring for the planet we all share is key, and without that shared responsibility as a priority for all people, we simply destroy the blue and green spaces that future generations have a right to engage with as we have. Surfing can teach people a lot about this. But otherness can also be an environmental other, such as testing your limits in new waves, or getting out of your comfort zone and trying surfing for the first time. • Sounds like you travel a lot. How do you manage to balance fatherhood and serious surf travel? It’s a tough balance, and I miss my kids tremendously when I work away. But I always keep travel project as short as possible and produce the subsequent work from home. Also, I try to give them a rich slice of my passion and learning from travel when I’m home, and engineer some trips for all of us. But Cornwall is a great place to live if you surf. We are a devoted beach family. I’m happiest when I’m on the beach with the kids. Cornwall’s gorse clad cliffs, bright granite, quartz sand and clear water is as good as it gets. There is a wild, rugged and raw energy to Cornwall that is unrivalled. Those warm snaps between May and October can deliver colours and experiences in the waves that I’ve had nowhere else – rainbow spray combed off the back on offshore days, seals, dolphins, basking sharks, and a local landscape that inspires me. Currently, a highlight in surfing for me is sharing waves with my 8 year old daughter Lola. I first put her on a board in warmwater waves (in Barbados) at 4 months, and aged 3 she stood alone in trim (in China) for the first time. She then started surfing summers in Cornwall, and aged 5 began to join me even in the winter with a warm wetsuit. Seeing her learn to read the waves and the ocean currents and swells is really special. Learning about the coastal environment is essential to have fun in surfing and be a ‘great’ surfer. My 2 year old son Ruben has not travelled away from Cornwall yet, so has not enjoyed the hotwater initiation to waveriding that Lola had. However, in the Cornish summer he loves getting in the water and I hope this summer he’ll be up-and-riding. Exciting times…. The ‘feeling’ of surfing is always compelling, and addictive, no matter what level you are at. We are all sharing the same priceless experiences of adrenaline, fear and fulfilment. • Is there anywhere you’re keen to explore and surf, but haven’t yet? Where’s next on the surf travel to do list? I have been to over 60 countries now, and while the highest quality waves are undeniably in Indonesia, I have developed a particular interest with West African culture, and the upbeat polyrhythmic music reflecting the ingenuity and charisma of the people in the face of hardships that would crush most of us. I particularly like the long powerful pointbreaks in Ghana, Liberia and Sierra Leone, and know there are many more countries in this region with similar quality surf. A single off-the-beaten path trip to West Africa might pack more bone-shaking and head spinning moments into a few weeks than many will experience in a lifetime. There are so many places that at some part of the year have rideable, totally unsurfed waves. The Mediterranean coast alone embraces 22 countries, and every winter undiscovered breaks will light up in this region. It is right on our doorstep – and often merely a cheap flight away. There are 195 countries in the world, and 151 with coastline. Mindfulness and Surfing: Reflections for Saltwater Souls is published by Leaping Hare Press, RRP £8.99.